My countdown to spring tells me we have 27 days to go. The photo tells the story of how I've spent the winter. The number of pastels out and available draw an enormous contrast to the little pochade I take with me while plein air painting. 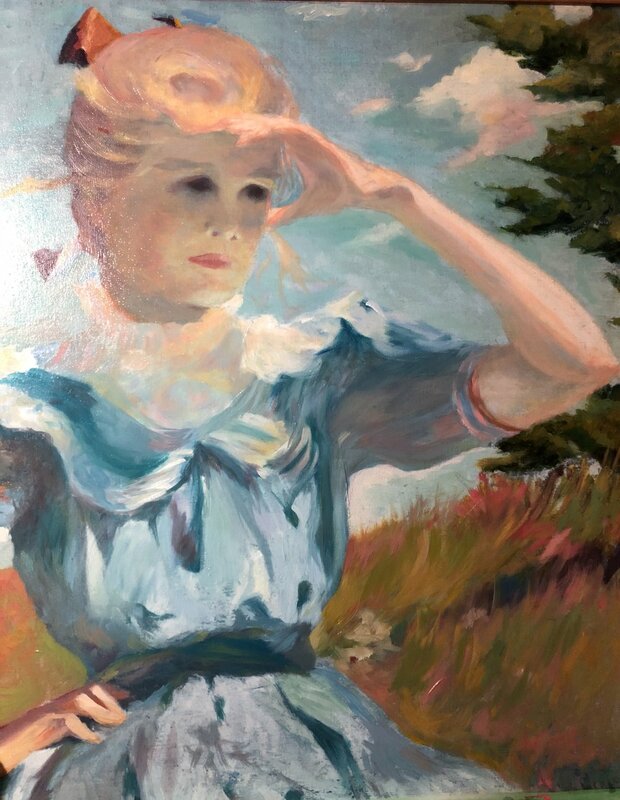 I've also had a wonderful time doing some oil painting this winter, restoring a Frank W. Benson reproduction. It's made me think about taking 10 tubes of paint outdoors instead of more than 100 pastels! We'll see. This is the redux of the Frank W. Benson reproduction of "Eleanor." The thing had turned blue over 20 years, so rather than throw it out, I decided to glaze new oil colors over the blued out canvas. It's not quite done yet, but it certainly has new life. I used the RISD online image as my guide to his colors. Love his palette! Much more to do on her dress.